Both sides had spells of dominance, but Dortmund were more ruthless in the final third. Sami Hyypia and Sascha Lewandowski named an unchanged side from last weekend’s 0-0 draw at Freiburg. Jurgen Klopp had Mitchell Langerak in goal rather than Roman Weidenfeller, with Felipe Santana in defence rather than Neven Subotic – both decisions forced upon him. Otherwise, this was his first-choice side. Dortmund started the game superbly, but came under significant pressure during the second half after Leverkusen changed to a more attack-minded formation. Dortmund were 2-0 up within the space of ten minutes, primarily because they successfully exploited the space in behind the Leverkusen defence. Although the home side weren’t attempting to press in the opening moments, instead seeking to contain before playing on the counter-attack, they seemed very prone to simple pieces of movement dragging the back four out of position, and other Dortmund players sprinting in behind. In general, Leverkusen’s focus upon denying Dortmund space between the lines worked well – none of the three attacking midfielders found room to create, but Robert Lewandowski had a very good game – his movement towards the ball created the first for Marco Reus’ goal, and then he won the penalty for the second goal. Like Lima against Braga recently, the major reason for Lewandowski’s threat was his ability to stretch the defence in either direction. 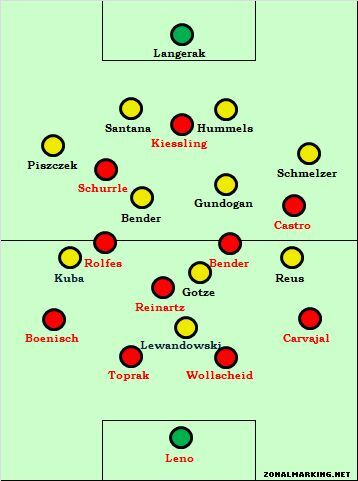 But with Leverkusen’s midfield sitting back and trying to deny spaces between the lines, they were also troubled by the amount of time Dortmund enjoyed in deeper positions. This was partly a result of Leverkusen’s unusual formation – they almost play a 4-4-2 / 4-5-1 hybrid, with Andre Schurrle’s tendency to stay high on the left covered by Simon Rolfes’ movement towards that side. But this leaves them without a number ten, and the flexible nature of the midfield makes it difficult for Lars Bender to move forward and press, for fear of leaving space behind him. Therefore, the two Dortmund midfielders enjoyed a huge amount of time on the ball, and there were two ways Dortmund exploited this. First, it wasn’t uncommon to see Mario Gotze drop into extraordinary deep positions, past the two holding midfielders and into the zone you’d usually associate with a deep-lying playmaker. He rarely played long passes, but this helped Dortmund retain the ball (at a time when they were already 2-0 up, and happy to slow the tempo). Second, Dortmund’s deepest midfielder – usually Ilkay Gundogan, could use his freedom to charge forward on the ball, doing this particularly well in the build-up to the first goal. 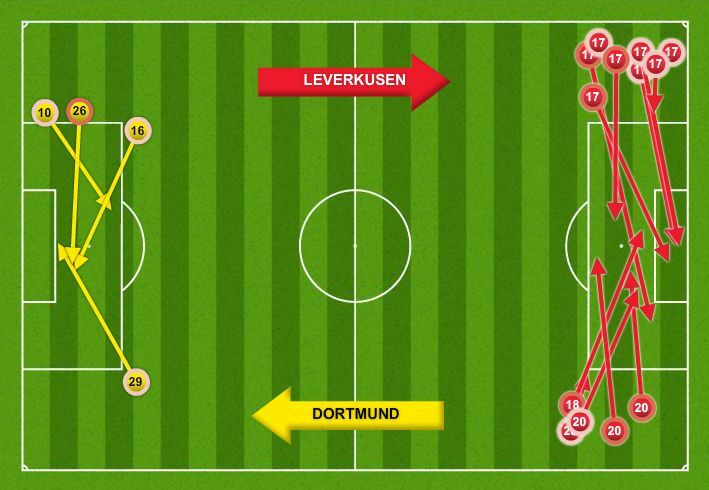 However, despite Dortmund’s early lead, there was also a significant threat from Leverkusen. They also attacked by breaking in behind Dortmund’s high defensive line, particularly with Gonzalo Castro. 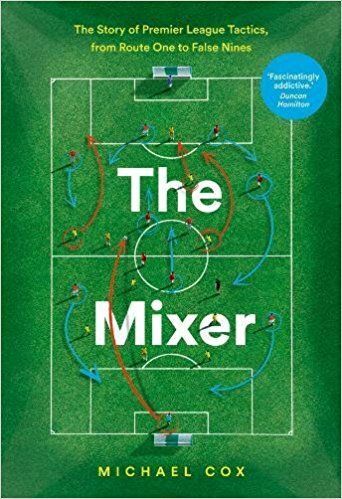 He motored forward from a right-sided position twice in the opening stages – once in the first minute when he lofted the ball over the crossbar, then later on the counter-attack when he managed to completely miss the ball as he shot. There was also Stefan Kiessling’s movement in behind – he was twice flagged offside in the opening 15 minutes, but Dortmund were taking a chance by using a high line, without putting great pressure on the ball in midfield. Leverkusen made an attack-minded substitution at half-time – Rolfes off, Sidney Sam on. Sam played on the right, whereas Rolfes had occupied a left-of-centre position, so this meant a change in role for both Castro (who moved left) and Schurrle (who became a left-sided second striker). Equally importantly, Leverkusen upped the tempo. They’d started too cagily and their pressing late in the second half was disjointed and half-hearted. Now, they were truly the dominant force, attacking with an extra outright attacker and giving Bender more freedom to connect the side. But Sam was the key player at the start of the second half. Dortmund appeared confused by his movement, unable to deal with his drifts into central positions, and in behind the defence – Marcel Schmelzer got into some terrible positions, allowing Sam too much freedom. Not only did this mean Sam got a couple of chances, it also opened up space for Daniel Carvajal to break into, meaning Leverkusen now offered a crossing threat from both sides. At the back, Stefan Reinartz often dropped into the defence to become a third central defender, enabling Leverkusen to play out more effectively and allow the full-backs to push up – this had happened in the first half, but seemed more effective when Dortmund sat deep and narrow after the break. Eventually, the pressure resulted in goalscoring chances, and Reinartz was the unlikely scorer of both Leverkusen goals following set-pieces. But the second half was about that concept coaches find it impossible to control – momentum. Leverkusen had utterly dominated the first 15 minutes of the second half, but having worked so hard to get back into the game, they conceded a remarkably cheap goal, because of an underhit backpass, within 60 seconds of equalising. Dortmund had silenced the crowd, and Leverkusen’s attacking was more timid. Then Dortmund won a penalty following a foul on Lewandowski in the box (the second of the game) and Blaszczykowski had the chance to put the game beyond Leverkusen – but his miss gave extra confidence to the home side, and given the topsy-turvy nature of the game, it was a huge boost. Dortmund would have been better off not winning the penalty in the first place, as their sudden mini-control the game vanished, and Leverkusen poured forward once again. In the end, it came down to quality in the final third – Leverkusen had further chances to equalise, most notably from a Carvajal cross to Schurrle – but they couldn’t quite find a way through for another equaliser. A fantastic, open game that swung one way and then the other. Leverkusen actually managed over twice as many shots (27-12) but the ‘on target’ difference was minimal (8-7), suggesting that quality of finishing played a big part. 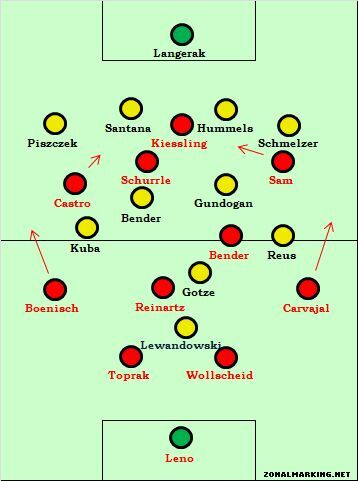 Perhaps the key thing here was how clever Dortmund were at exploiting space – the movement and positioning of Gundogan, Gotze and Lewandowski, three players along the spine of the side, was both unusual but logical and extremely helpful to Dortmund’s attacking. This one had everyone salivating before the game started, and certainly lived up to the hype. Statistics wise, it’s not unfair to say that Dortmund was kinda in their comfort zone – they’ve found themselves wanting when dominating possession this season. I personally would’ve thought a clinical defense oriented game from Leverkusen, a la the Bayern game (where their goals really came from individual mistakes from the Bayern defense). 27 shots to 2 set piece goals isn’t really something you can call a “concept”, mister Hyypia. 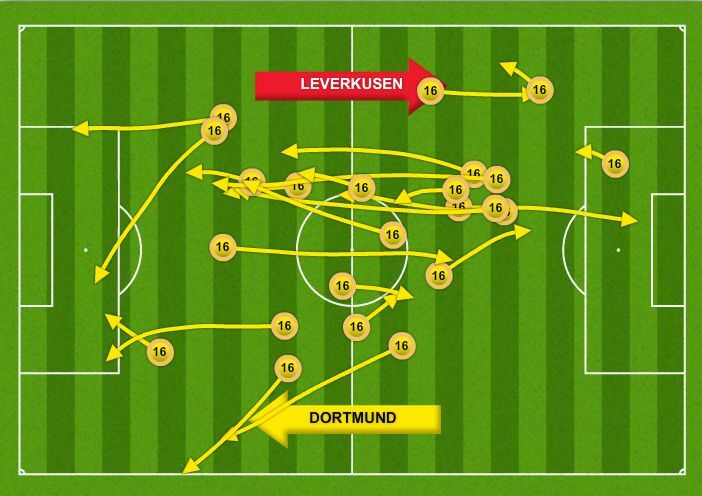 I guess what really happened here was Dortmund forcing their reactive game on Leverkusen – if you force the opponent into proactive play, is that proactive play itself? Lewandowski played like the best center forward in Germany. It would be a shame for BVB fans should he join Bayern next season. Easily the best contested match in Bundesliga and best 3 in Europe I had the pleasure to watch sitting here in India. What a game that was! Was absolutely challenging for my heart (I’m Dortmund fan)! For me Leverkusen was by far the most dangerous side we have played this season, all competitions included. Can’t remember the last time we got dominated like that AND had to allow so many really good chances. If it wasn’t for Wollscheids’ mistake I’m sure we would have lost the game and the penalty miss wasn’t good for my nerves, too! for me, Dortmund are a much finer team then Bayern Muncih. however, due to their money situation, they are unable to buy the best stars. at least they can sell top players at high prices like Kagawa! I think they could buy expensive players if they wanted to. They already bought Reus for 17m and made a profit last season of 30m. It’s more the philosophy to not buy huge stars and rather buy talents to form them to the players they want and need. Also the character of young players is more suitable to bvb cause they are still willing to learn and listen. From the financial point of view I think it’s also more about the wages that those players want, they won’t ruin their wagestructure only for a big name which could bring more trouble and in the end could be even a fail transfer. Bvb have learned from the nearly bankrupt times 6 years ago. And appart from that BVB is still not that much of a big name that “stars” would prefer joining them instead other big clubs who pay more.. Pressing is always proactive. Only if the defending squad deos not press at all they’re reactive. In such a pressing intense game you really can’t say which squad is attacking and which is defending. You even cannot use these terms. It’s more like playmaking with the ball and playmaking without the ball. ZM, you’ve written about Leverkusen a few times and I’ve been wondering whether you see any point in thinking of their formation as a variant of 4-3-2-1? I ask this because there is some tactical interest in Finland towards the Leverkusen system via the Hyypiä connection and the fact that our national team tries to play a modernized 4-3-2-1. This brings up some debate whether Hyypiä and Lewandowski are developing something similar in Leverkusen. The main differences as I see them are the roles of the two attacking midfielders/support strikers and that of the deepest midfielder. It’s of course debatable whether there is any sense in considering Schürrle and Castro to play similar positions at all. They have a clear asymmetry between their natural tendencies (high/narrow vs. back/wide) and do very different things on attack. On the other hand, Castro plays a separate game from the core midfield trio as well and defensively they both are usually playing against the opponent full-backs. The Finnish 4-3-2-1 seems to have problems in creating controlled passing plays in the technically overloaded central area and generating width from either support strikers or full-backs. Defensively, the opponent full-backs have no dedicated counterpart and this results in the occasional mixup where it’s unclear at what point on the pitch they should be covered by whom. I also mentioned the difference in how the midfield anchorman plays. Reinartz’s double-duty as the third center back allows the full-backs to take more liberties to crash forward and provide width. This is especially important on the left side since Schürrle’s game is to drift inside (seriously, Boenisch of all people piling on the crosses!). Finland does this differently. We do have a talented but more conventional deep distributor playing on Reinartz’s spot but the lack of width from the full-backs results in a congested middle pitch. 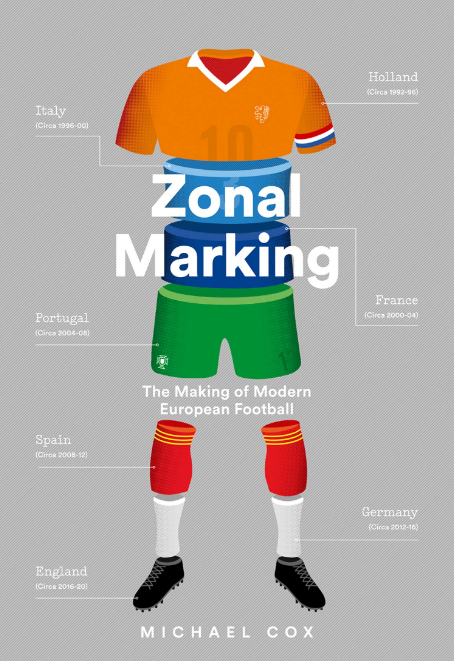 This all makes me think that a 4-3-2-1 is not viable in modern football unless you’re Spain. On the other hand, Leverkusen seem to be finding solutions to the problem areas described above so I’m curious whether thinking of Leverkusen’s system as a 4-3-2-1 provides any descriptive value. I thought Leverkusen were unlucky to lose but was more impressed with Dortmund, this game was ideal for Reus and Kuba. The build up reminded me of the match in 2011 after the winter break. Just a shame that Castro wasn’t able to strike the ball cleanly and Kiessling’s diving header going wide (? ), though his assist was brilliant. Even Boenisch has time and space on the counter-attacks. Maybe switching Schurrle out wide would’ve caused more problems. Dortmund’s high-line in this match reminded me of Eintracht Frankfurt approach all season: very risky but it can pay off in the bundesliga. Maybe I’m wrong, but that’s the pattern I’m seeing. Actually Dortmund play this highline since 2-3 seasons and Armin Veh (frankfurt coach) said that BVB are their role model. And it not only pays off in the Bundesliga as you could see in the CL vs man city for example . The most “elite” teams play this high line anyway (barca, bayern, real). My point is that their high-line against Leverkusen was more obvious and risky than usual. Re Man.City, it seems they prepared well and took the risk, while in both games against Ajax, their shape and pressing was general and appropriate. I understand your point, but I’m saying if Eintracht Frankfurt for example, want to play in Europe, they surely have change their pressing game slightly. Hey? I’m waiting England x Brazil’ s text. I’m journalist from Brazil and I always follow your analysis. Thank you. Good job guy!